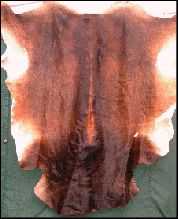 Our Cow Skins are superb quality with short hairs. Sizes differ slightly but all of them are fairly large and some extra large. 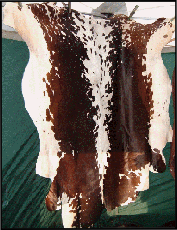 Patterns and colours vary according to the breed but those of the same breed are quite similar. We’ve therefore given them names to make reference to them simple! People who see them at shows often tell us they are wonderful quality which should give you some idea that these are special! Please phone 0800 0588 911 and arrange for us to call you back and let you know which we have in stock. Postage, packing and insurance: £20.